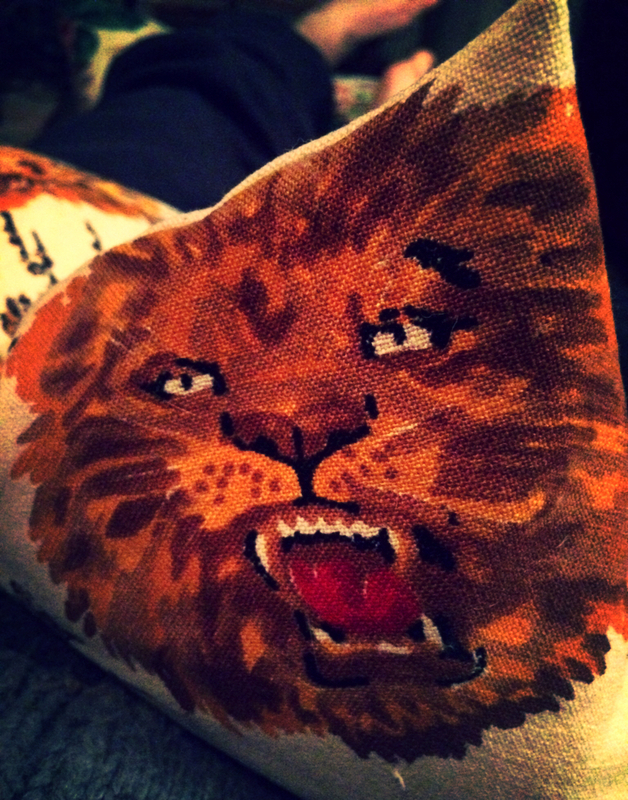 Scene One – I was sat in a room with a fully-grown, male Lion. He was awesome. He wasn’t menacing, twitchy, timid or aloof but playful. I was in one corner of the room sat passively, a little discouraged, head resting somewhat forlorn on my fist like Rodin’s Thinker. He was rolling around on his back on another side of the room, restless but playful. While I remained sitting away from Him, the Lion started to approach and initiate with me: He came over from His corner to stand in front of me, right in my face, to play. He wanted me to tickle behind His ear and try and get Him in a head-lock. He loved it. But He is a Lion! He had enormous paws, massively powerful legs and a maned head bigger than the whole of me. It didn’t feel fully safe with His latent power controlled straight in front of my face. So it was an unnerving play, but exhilarating. As though unsure or even afraid, and suspecting His boredom or limited attention span with me, I’d get fidgety and want the play to stop. And the Lion would back off and circle a little. But He kept on coming back to play. All He wanted to do was play with me. In the morning I realised this was a picture of the very heart-beat of prayer: The all-powerful, playful Lion of the Tribe of Judah wanted to be with me constantly. He wanted my attention. He wanted my affection and to show me His. There was an underlying awe and even fear of His power but a fundamental trust in His heart towards me. Scene Two – A shorter scene outside at night lit by outbreaks of fire. I was looking on to the horrific scene of people being eaten alive by a number of lions of a different kind. The people seemed paralysed somehow, their torsos laid bare while the lions devoured them. Intestines. Blood. Screaming. That sort of thing. In the morning I realised this was a picture of the very heart-beat of 1) fear and 2) spiritual boredom & pride (from 1 Peter 5 that threatens you and threatens me – a ridiculously proud enemy looking for those he can devour). Jesus, our Hero, our Saviour and the Lion of the Tribe of Judah would win our hearts again and again and again and have us know that He wants to play with us and that we might learn to call this prayer – to know a heavenly blend of reverent fear and playful intimacy. The devil, our enemy and a lion so proud and unnatural that he’d roar while hunting, means for us to be fearful, spiritually bored and unconcerned about praying and discovering this as a playful reality with Jesus. We must resist him. I think playing with God might be a key in this resistance.